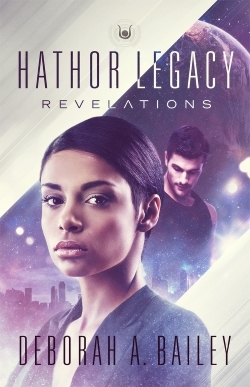 If you enjoy sci-fi romances that follow the same couple over several books and heroines with extraordinary abilities, then you’ll want to check out author Deborah A. Bailey’s Hathor Legacy series. She’s aboard TGE with an exclusive cover reveal of the series’ third book, REVELATIONS! The worlds of the Guardians and Novacorp are put on a collision course where only one side may come out on top. Nadira is called on to make the ultimate sacrifice to save the legacy of the First Families, the original settlers of Hathor, while Guardians, Kasema and Deshtu are faced with the choice to unite or be brought completely under Novacorp control. Old scores are settled and long-hidden truths are revealed, and at the end Nadira and Jonathan's relationship and their world will never be the same.